My enthusiasm for high-end audio seems to be continually renewable. This is primarily because of what it adds to my enjoyment of music, but I also enjoy the technical side of the hobby, and learning about the gear and technologies that make the endeavor possible. Yet I am often disappointed with new products from new companies. So often, cleverly conceived ideas are poorly executed in practice, and the end result is something that doesnt fulfill the promise. There have been times when Ive wanted to say to a manufacturer, "Can you make sure the one you send me is right? Because I can imagine that not all of them are." Its a shame that Ive been conditioned to expect that all will not be well with much of what I receive. Not so with Sound Fusion and their Luna SF-70 loudspeaker ($10,106 CDN per pair). 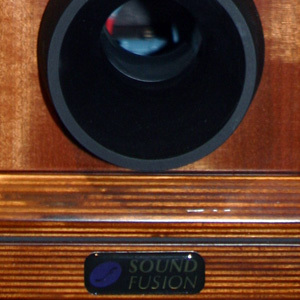 Sound Fusion is a relatively new Canadian loudspeaker manufacturer, established in 2002, whose core business background is in furniture manufacturing through its parent company, Global Wood Concepts. This bodes well for the end user of their loudspeakers -- Sound Fusion has apparently bypassed the learning curve of how to make a finished commercial product. When the Lunas arrived, they were packaged already assembled, in crates that themselves were better constructed than many of the high-end products Ive seen over the years. The speakers, at least visually and structurally, were all that they should be. But were they just pretty furniture? Popping the top off the two large wooden crates in my garage revealed the strikingly attractive Luna SF-70s, already coupled to their substantial matching stands. Actually, this stand should be thought of as an integral part of the loudspeaker -- it comes bolted to the bottom of the speaker cabinet itself, with which it forms a single solid unit. Speaking of the speaker cabinet, that is where much of Sound Fusions manufacturing expertise and innovation lie. Instead of an enclosure assembled from conventional flat panels joined at the edges, the Luna is constructed of many sheets of MDF joined face to face, starting at the baffle and extending to the cabinet rear. Think of a series of coasters turned on edge, their insides hollowed out, then stacked and glued together. According to Sound Fusion, this type of construction gives their drivers a nonresonant platform from which to work. It also gives the speakers a unique appearance. Their somewhat teardropped shape is veneered in either macore or walnut for a stunning -- and inert -- finished product. The Lunas front baffle is not just a flat panel, however. The 6.5" Scan-Speak woofer is mounted to a circular subbaffle that stands out in relief from the loudspeakers face. 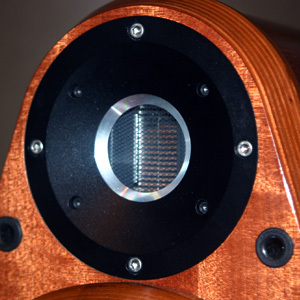 The high-frequency driver mounted above it, in this case a true ribbon tweeter, is recessed from the plane of the woofer, its integral faceplates curve closely tracking the speaker cabinets upper contour. Sound Fusions literature doesnt state that this slight recess is an attempt to time-align the drivers outputs, but that would make sense. Overall, the baffle consumes little more real estate than is needed to house the drivers. Little construction details matter, and they are not overlooked in the Luna SF-70. The drivers are fastened with machine screws to the cabinets. 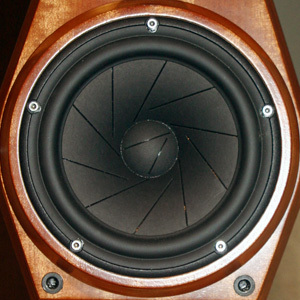 In a speaker costing $6995/pair, wood screws would be unacceptable -- they loosen over time, and if you have to replace a driver, the second time you drive screws into the same holes you stand a good chance of stripping the wood. Below the cylindrical main cabinet is a rectangular box that extends the cabinet proper down to the stand. The rear of this lower cabinet houses two sets of nicely made five-way, gold-plated binding posts for biwiring (Sound Fusion does not recommend biamping). On this cabinets front, a large aluminum port juts out several inches from the face, and inside it is the speakers crossover network. Coupled together, the lower and upper cabinets comprise an impressive amount of internal volume for what is, essentially, a bookshelf speaker. With all of its interesting design flairs, the Luna SF-70 doesnt look exorbitantly large, but there is a lot of speaker here. By no means is this a compact bookshelf speaker. The stand is something to look at itself. Built of MDF-reinforced polyurethane and wood finished to match the speaker proper, it has its own interesting design features. A multi-ply plinth houses large brass spikes that fit into Vibe Buster 1s, Sound Fusions own vibration-damping floor couplers. The supports -- two tubes and a curved wooden slat -- combine for a look that has depth and dimension. The Luna has no speaker grille per se, but acrylic covers that protect the drivers when the speakers are not in use. These covers, when not in use themselves, can be snapped on to the rear baffle -- a clever idea. On its stand, the SF-70 measures 46"H x 15"W x 18"D and weighs 68 pounds. 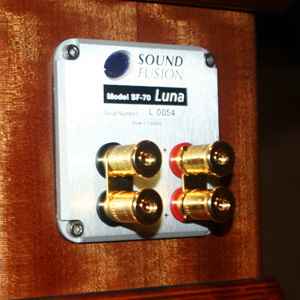 Sound Fusion rates the Luna with a sensitivity of 90dB, an impedance of 4 ohms, and a frequency response of 40Hz-60kHz. I suspect that most people will either love or hate this speakers looks. I found the Luna SF-70 more attractive in person than it appeared to me beforehand in photos. Open, open, open. Listen to the Luna SF-70s with some acoustic guitar, such as that on "Sweet Euphoria," from Chris Cornells Euphoria Morning [CD, Interscope 90412], and youll hear an open, peppy top end that lets you know youre listening to an uncommon driver. The ribbon tweeter doesnt hit you over the head with its presence, but it does produce music that washes over your ears with sound that is refined and energetic yet detailed and rich in ambience. I was able to easily hear all of the decay of the notes, the fingers rubbing on the strings, and the incisive leading edge of the instrument as Cornell played away. If, like me, you value detail retrieval, youll appreciate what the Luna does as well as what it doesnt do: grate on your nerves. The ribbon element was very easy on the ears and produced no listener fatigue whatsoever. This is a fine line to walk -- and, in my experience, a rarity. The high frequencies were not meaty and sweet, like what you hear from Dynaudios Esotar tweeter, but were more extended, and by a long shot. I found that one key to getting the Lunas ribbon tweeter to perform best was to use Sound Fusions Vibe Buster 1 floor couplers, which are provided. Once I had the speakers properly positioned, which involved a fair amount of shuffling and listening sans spikes, I added the Vibe Busters, which raised the tweeter about an inch. That additional height made the highs and mids jell perfectly, and took just a hint of edge off the very highest frequencies. Michael Bubl�s Its Time [CD, Reprise 48946] displayed perfect transitions from detailed highs into a smooth midrange. I dont want to give the impression that the Lunas highs were detached from the rest of the frequency spectrum, or that they were in any way harsh -- thats not what I heard. Its just that if youre used to conventional dome and cone tweeters, and then listen to the Lunas, youll hear something that sounds quite different. Over the days and weeks that I had the Lunas in my Music Vault listening room, I came to seriously appreciate what they were doing: providing detailed and clearly focused sound with any and all music I threw at them. Their overall performance became quite a comfortable and engaging thing to live with. Continuing on, the midrange advanced seamlessly from what Id first heard in the highs. Vocals were open and transparent, and transients were quickly handled without any apparent cabinet noise. Rosanne Cashs "Western Wall," from her Rules of Travel [CD, Capitol 37757], had just enough body and warmth to make her voice and the guitar accompaniment believable and present, while images within the quite expansive soundstage were painted with good depth and truly exceptional width. I could spread the Luna SF-70s quite far apart -- which widened the soundstage from wall to wall -- and not lose any specificity in the center of the stage. I loved the fact that I could close my eyes and the walls would not only seem to disappear, but the space around me would dramatically expand. Through it all, vocals that were center stage on my recordings stayed put in the center of my room. Imaging fanatics take note: Youll cotton to this sound, so pull out all of those live, minimally miked recordings. Theyll sound lovely through the Lunas, which will give you a close approximation of the original venue if the recording allows. The lower registers surprised me even if they didnt truly satisfy my inner bass head. I listened to a number of recordings that opened my eyes and made me pay attention, due to the bass energy that the Lunas could produce. Enyas Amarantine [CD, Reprise 49474], particularly the title track, has excellent bass depth and pitch, and only a speaker capable of producing well-delineated low frequencies can really reproduce it successfully. The Lunas could just do it -- they energized "Amarantine" on a huge soundstage, with all of the flowing majesty of Enyas music intact, lacking only the very last few hertz. That somewhat limited low-end extension could leave you hankering for just a touch more bass -- especially since what this speaker did produce was so satisfying. By no means did it sacrifice quality for quantity. Still, if I were buying, and being the professed bass fanatic that I am, I would have to try the Lunas larger brother, the lower-playing Nova. If all else remained sonically the same and the additional bucks were available, then why not? Speaking of the Novas, both they and the Lunas are available as fully powered models, under the respective names of Hyperion and Ariel. Additionally, theres a new entry-level design, the Horizon. There are also a number of speaker stands and equipment supports, and even more vibration-damping footers. Sound Fusion seems to have a rapidly expanding product line. Wonder whats next? I finished reviewing the Silverline Grandeur Mk.II floorstanding loudspeakers ($15,000/pair) in April of this year. They could not be more different from the Lunas, physically and sonically. The Lunas embrace wood as they sit showing off their finely crafted furniture-grade appearance. The Silverlines are painted in a high-gloss automotive finish, are large floorstanders by anyones definition, and are sure to make a bold statement in a room. The disparities in sound were even more striking. Besides my aforementioned comments regarding the differences between the Esotar tweeter and the Lunas ribbon -- the latter being much more extended and open than the bolder, sweeter-sounding Dynaudio -- the differences between these speakers whole sound spectrums were great. The Luna presented a more present midrange, whereas the Silverlines are laid-back, even recessed, by comparison. Do you want your music out front, greeting you with a quick, precise character, or do you prefer a more distant quality that invites you to meet the music halfway? The Silverlines are much bigger floorstanders with two additional bass drivers in each cabinet, so its no surprise that they play louder and lower than the Lunas, and are better with hard rock played at rock-type levels -- their bass and midbass will punch you in the gut with a Metallica kick-drum. The Silverlines also cost a lot more. A better comparison in terms of sound, price, and size would have been Sound Fusions own Nova, mentioned earlier. Still, the Lunas were able to cast a larger soundstage, and communicated the ambient features of live recordings in a clearly superior way. Their midrange was more front and center, making male and female vocals rich with information, and their imaging was about as good as youll hear from any pair of speakers. Im glad to not damn the Sound Fusion Luna SF-70 with faint praise by saying that its a unique product from a company with a lot of promise. The speaker is that, but theres so much more. Their promise was clearly realized before the Lunas got to me. Sound Fusion is producing wholly realized speakers that are ready for prime time now. They obviously design and engineer their speakers with skill, and they manufacture them with precision. They even ship them in a manner that a customer, or a reviewer, will appreciate: the quality of their packaging is an extension of the quality with which they build their speakers. Whether the Luna SF-70s sound and appearance will appeal to you are, as always, things youll have to decide for yourself. But if what you see in the accompanying photo and what Ive described of their performance are to your liking, I can bet that, once you get them in front of you, in the flesh, you wont be disappointed. These speakers are really, really good in the here and now, and deserve all the attention they can get. I enjoyed every minute I spent with them.